So you’ve decided it is time to explore an alternative way of living? “Off-the-grid” refers to living in homes that are autonomous, meaning they do not rely on municipal water supply, sewer, natural gas, electrical power grid, or similar utility services. A true off-grid house is able to operate completely independently of all traditional public utility services. Below are 15 tips for someone to consider when they’ve made the decision to move “off the grid”. Walk away from a life of servitude, and do what you love to do… For a few 10′s of thousands of dollars you can be living on your own land, in your own cabin, and doing your own thing. What kind of legacy do we want to leave our children? Do we really want to teach them that we MUST WORK OUT LIVES FOR SOMEONE ELSE! 3. YOU DO NOT NEED TO WORK FOR SOMEONE ELSE! 5. YOUR JOB IS YOUR FAMILY! There are some steps you can take now that will allow you to go off grid sooner. Cut out the bills you don’t need. Cable TV is one. Unless you use cable TV for business, there’s really no reason other than temporary entertainment. You can watch TV again once you go off grid. Wouldn’t you rather put that $50-$120 or more per month toward your off grid fund? You can save money by not eating out often, and that includes frivolous purchases of small items which add up over the course of a month. Coffee at your local coffee shop, candy bars, snacks, fast food, and drinks and sodas. Not only are they bad for you, they cost you money. You could save $100 or more per month. You can sell your old stuff sitting in the garage, attic and basement. You know that shed out back that’s full of junk you never use, or that back room that you just throw stuff when you’re not using it? It’s likely that if you haven’t used it in a year or more, you probably don’t need it. Wouldn’t you rather put that money to good use. That’s money sitting there collecting dust. Even if it’s only $5, if there were a $5 bill laying on the ground you’d pick it up wouldn’t you? So why do you let your old stuff you never use just sit there and take up space. Use it for getting yourself off the grid. Sell it, and put that money in the bank! You can start reclaiming scrap materials like pallets, lumber, sheet metal, pipe, fencing, and other necessities that you will use on your off grid homestead. You can purchase a small 1 acre or 5 acre piece of land for very little money down in many places of the world. The USA has lots of land for sale with great financing options that won’t break the bank. You don’t need a sprawling ranch that’s hundreds of acres. 1 acre will suffice, and you can get it for as little as $1000 in some parts of the USA. Even at $10k per acre is BETTER than living in a subdivision isn’t it? Would you pay $10k for the freedom that 1 acre of beautiful country land will give you? Remember you’re not buying that land so much as you’re buying the lifestyle and the freedom it provides. With your own land you can grow TONS of food and live the life you and your family will love. If you want to live off the grid, you will probably have to relocate to cut your expenses. The land you buy will most likely be further away form the city and not exactly convenient to getting into town at a moments notice, but you will have more freedom of movement, and more room to move and expand your homestead. You have room to grow your own food and animals, and build a nice home for you and your family. You don’t need to mortgage your life away for the next 30 years. 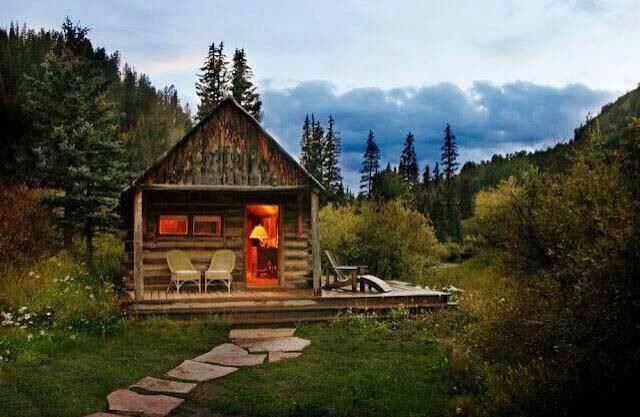 You can build a small log cabin or tiny house for a fraction of what you’re currently paying. Living small allows you to concentrate on the things that are more important to you, like family, and friends, and making good memories with your loved ones. Read up on how to start growing your own food in your own backyard. There are lots of methods and it’s a good idea to learn as many as possible BEFORE you make the move to go off grid. 15. GO BACK TO SCHOOL TO LEARN ABOUT SOMETHING YOU LOVE! Learn a new trade or skill that you’ve always wanted to learn. Get a degree if you’re so inclined. If you don;t want a degree, just go for enrichment and the gain the knowledge. Knowledge will last you a lifetime and it expands as you grow. There’s not reason why you can’t do what you really want to do, you just have to want to do it. Here is a list of over 12 dozen places online where you can get a free education. You can own your own home without putting yourself and your children in debt for 30 years. You can build your own cabin, contrary to what people would have you believe. You can grow your own food. You don’t have to buy your food from places that put dangerous chemicals and preservatives in your food. You can eat organic food without breaking the bank or unknowingly eating eating genetically modified foods. You can live a happier more fulfilling life when you and your partner/spouse are not both working 60+ hours per week just to make ends meet. You can SPEND MORE QUALITY TIME with your family. You can look forward to getting out of bed in the morning. You can do something you love and are excited about each day. You’re only limited by how you think about the world. Here are some incredible photos of people living off the grid who abandoned Civilization for life in the wilderness.